For many US voters, the election of President Donald Trump is a worrying step backwards. But for many others, his rise to power is an exciting opportunity for national renewal. This division reflects the emergence of a new 21st-century politics – one waged between genuine cynics and hopeful nihilists. The former think the system is unchangeable but that small progress is achievable, while the latter still believe in the possibility of real change. They are willing to destroy the system to achieve that change, regardless of the costs. 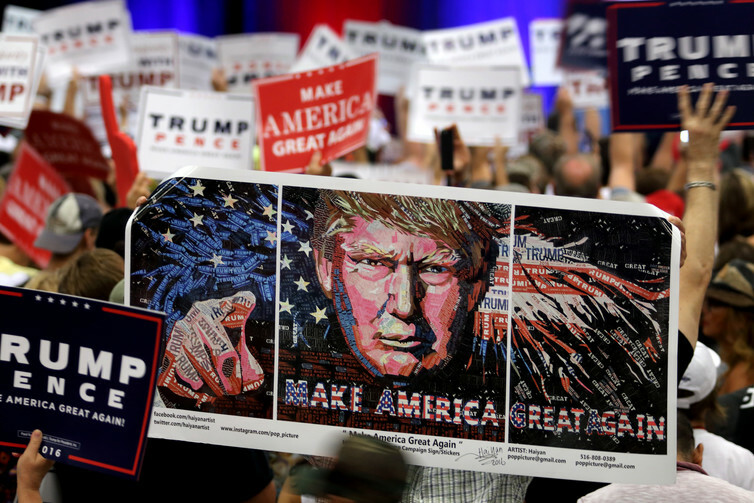 Trump’s unexpected victory was built on a promise to “make America great again” and his popularity sprung from a potent mix of nationalism, xenophobia and populism. Throughout the campaign supporters were easy targets of ridicule for the political and media mainstream. They were commonly dismissed as misinformed and portrayed as being driven by prejudice. They were the “basket of deplorables” threatening American progress, democracy and even basic decency. However legitimate these judgements might have been, they ignored the essential appeal of Trump’s candidacy. Trump promised to re-empower people who were economically and politically “left behind” by globalisation and corporate rule. He brought a sense of renewed optimism. As a politician he played heavily on this desire for radical change. He pledged to speak for “the forgotten men and women of our country – people who work hard but no longer have a voice”. Amid his outlandish claims, unjustifiable attacks on immigrants, minorities, women, and even the disabled, he resonated with a strong aspiration to destroy a failing status quo. Hillary Clinton seemed to be the exact opposite. On the campaign trail she stressed the need for tolerance, economic reform and national unity. Her critics never tired, for good reason, of highlighting how her record did little to support her now stated high-minded ideals. They pointed to her hawkishness abroad and questionable progressive actions at home. Added to that, her closeness to Wall Street and perceived corruption also dampened belief that she could be trusted to deliver on her already scaled back promises of change. Such centrism has emerged from a deep sense of political cynicism. For Clinton supporters, the possibility of a dramatic revolution seems naive and idealistic in the extreme. Such thinking, they hold, totally ignores the cold, hard realities of the 21st century, where the free market is here to stay, globalisation cannot be turned back and the best that could be hoped for are minor improvements. At the heart of this cynicism lies the pragmatic belief in the possibility of bettering society. Proponents want to achieve reforms despite an entrenched economic and political system. They had long ago given up on winning the war but there were still real and important battles to be fought. If nothing else this election is the death knell for such “responsible” and well-intentioned political cynicism. There’s a popular demand for radical transformation that has been dramatically underestimated. The new era is one that may be nihilistic but is also hopeful. Despite their differences, the cynicism and nihilism are two understandable responses to neoliberalism. Both reflect how difficult it has become to fight an order that prioritises profit over people. The nihilists have won this election because being “pragmatic” does not address the large-scale systematic changes that are needed to fight rising inequality. Nevertheless, the impulse of joyful destruction as expressed through Trump – and indeed Brexit – threatens to make an already bad situation much worse. It would take radical moves to shatter institutionalised racism and make progress on climate change, but no one can be expecting those moves to be made by President Trump. The only way to fight against this nihilism is to replace cynicism with a politics that offers the possibility of meaningful change. While Bernie Sanders ultimately supported Clinton after she defeated him in the Democratic primary, his call for a progressive “political revolution” should be seriously heeded. This means proposing bold programmes that would dramatically challenge the status quo. It would also entail embracing a spirit not of resignation but “experimentation” – being willing to inventively adopt ideas such as participatory budgeting, in which ordinary people get a say in how public funds are spent, and even more radically expanding the economic and political imagination to envision what a more emancipated “post-capitalist” society could look like. The days of cynicism may be over but that does not mean that nihilism has won forever. In this spirit, it is essential to promote an alternative politics that would make replacing the current order truly worthwhile.